Enda Kenny fired his parting shot at the end of his final Cabinet meeting as Taoiseach. 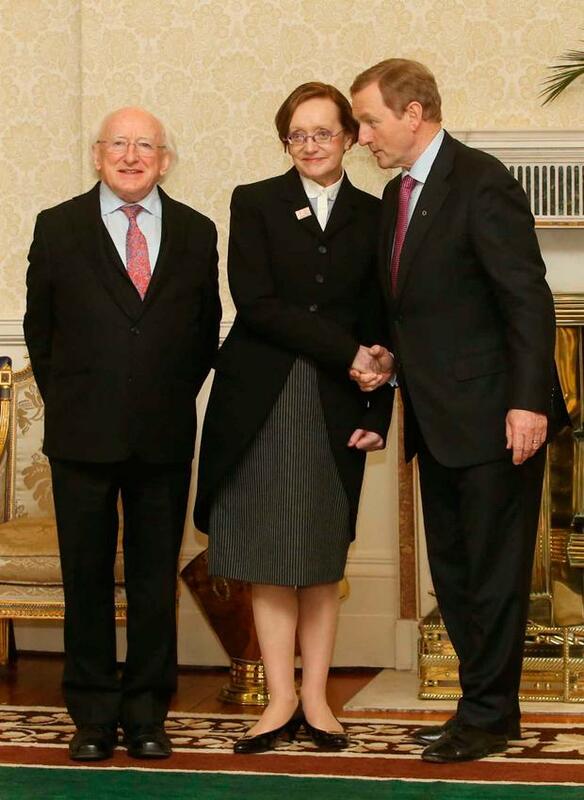 He is believed to have primed his Minister for Justice, Frances Fitzgerald, shortly before the meeting began. When it opened, the Fine Gael and Independent Alliance ministers trotted through the government agenda with the humour and solemnity befitting Kenny's last day in office. It was also Finance Minister Michael Noonan's Cabinet swansong. It was no secret either that Maire Whelan, the Attorney General who sat at the Cabinet table, was also moving on after six years of loyal service to Kenny's government. Although it seems many of his ministerial colleagues were apparently unaware at that point of Kenny's plans for her. There wasn't much on the government list. According to Denis Naughten, the independent Minister for Communications, Climate Action and Environment, it was "very, very light. There was pretty much nothing on the Cabinet agenda, in fact. There was very little discussion on anything other than the pay talks." Midway through the meeting came a tasty morsel for Shane Ross, the Minister for Transport, Naughten's Independent Alliance colleague. Frances Fitzgerald distributed papers to her colleagues on a review of six Garda stations that were closed during the austerity cuts. One of the stations, in Stepaside, is in Ross's Dublin Rathdown constituency. Re-opening it was one of Ross's two demands for entering government: that and judicial reform. Fine Gael would only commit to a review. Ross had pushed for a decision for months. In March, he thought he had it, reportedly commissioning leaflets heralding the station's re-opening. But he had jumped the gun and the leaflets stayed in storage. Last Tuesday, his time had come. Fitzgerald proposed that the government re-open Stepaside Garda Station and postpone a decision on the other five. Ross must have been delighted. He now had both of his key demands pretty much in the bag. Perhaps the news helped soften up Ross for what was coming. Like Fitzgerald, he had also been given the "heads up" beforehand. At the end of the meeting, Frances Fitzgerald proposed that the Attorney General, Maire Whelan, was to be nominated as a judge at the Court of Appeal and it was clear that this was the wish of Enda Kenny, the Taoiseach. It is believed that Maire Whelan remained at the Cabinet table, as the proposal was put to the Cabinet ministers. There was nothing in the agenda about her elevation. It appears to have taken the Cabinet by surprise and there was little or no discussion about it. Naughten was annoyed because he and Katherine Zappone, the independent Children's Minister, had an agreement with Fine Gael that they would get the "heads up" on matters requiring government decision to avoid being caught off guard. "There was a procedure agreed with Katherine Zappone and myself in relation to a 'heads up' on such appointments," Naughten told his local radio station, Northern Sound. "In fact, I had discussed that very issue with Leo Varadkar the previous week because at the previous week's Cabinet meeting, a number of memoranda had come forward that hadn't been agreed in advance and I had expressed my concern and reservation about it." So the proposal "came as a surprise to me, and I understand as a surprise to the vast majority of the Cabinet", he said. Regina Doherty, the Fine Gael TD and chief whip who would shortly be promoted to a minister, confirmed the element of surprise to RTE radio: "No, I didn't know she was going to be appointed, it wasn't on the documentation that was circulated in the days before the meeting." She stressed that she fully backed Whelan's appointment. Shane Ross, it appears, was the only minister to protest. He was the minister who had championed judicial reform and lashed the practice of politicians signing off on judicial appointments as "jobs for the boys". Judicial reform was one of his key demands on entering government, and as with Stepaside Garda Station, he had hounded his colleagues. He had gone so far as to block the appointments of a succession of judges that came before Cabinet. He only called off his principled protest in October when he was told his action was clogging up the courts system. Last month, the Government finally signed off on his judicial reform bill and it is scheduled to make its debut in the Oireachtas this week. Ross did not let Enda Kenny's plans to promote Maire Whelan to be a judge on the Court of Appeal go unremarked at the Cabinet meeting. According to one source, Ross was forthright, telling his Cabinet colleagues that the system was "rotten". A spokesperson said he "expressed his ongoing dissatisfaction with the old system of appointing judges" at the Cabinet meeting, a spokesperson later said. "But as he had made an agreement [to stop blocking judicial appointments in October], the appointment went through." Ross signed off on Maire Whelan's appointment, as did every single Cabinet member present. "It was the very last act of the outgoing cabinet," Naughten later said. The ministers gave a round of applause for Enda Kenny and it was over. Ross hurried off to share his good news with his constituents. By 12.30pm, he had tweeted "delighted to announce that Stepaside Garda Station WILL reopen!! Well done all!!" and zapped his pre-prepared mailshots to inboxes across Dublin South. Meanwhile, down at the Law Library, eyebrows were raised but not at Maire Whelan's proposed elevation to the Court of Appeal, according to legal sources. What surprised was that Frank Callanan, a senior counsel and a trustee of Fine Gael, did not get the gig. He was believed to be a shoo-in, but instead Varadkar appointed Seamus Woulfe, a senior counsel who has acted for Fine Gael. Micheal Martin, the Fianna Fail leader, sniffed the air and smelt a "stroke". He welcomed Leo Varadkar last Wednesday by accusing him of stroke politics and telling him the whole thing "stinks". Then he rounded on Ross. "Where once he [Ross] insisted on removing politics completely from such appointments, he has now agreed to the most directly political appointment in nearly a quarter of a century." Or as Niall Collins, the Fianna Fail TD for Limerick put it last week, Ross was "neutered". And so Leo Varadkar's first week as Taoiseach has been tainted by a row over cronyism that has the potential to escalate into a crisis with Fianna Fail blowing hard about pulling its support unless it gets answers - a request that Leo Varadkar has so far refused. It's been billed as Varadkar's "first test" but this is no playground contest to put the new boy through his paces. The shape-throwing by Fianna Fail and the Independent Alliance mask the more serious issues of transparency at the heart of this controversy. Maire Whelan was an admired and liked Attorney General who had earned the respect of her Fine Gael colleagues. Politicians on all sides have been at pains to point out that their objections are not personal and no one doubts her qualifications. Her background is in the Labour Party where she served as financial secretary and she maintained a low legal profile, working mostly in family law. But she forged a close working relationship with the Taoiseach, who stood by her following the criticism of her in the Fennelly Commission, most notably for backtracking on a particularly dramatic statement she made to the Commission about the impact of recordings in Garda stations. Micheal Martin referred to the dark cloud of the Fennelly Commission when he spoke in the Dail last Wednesday. But the party has zoned on the "process", as this is where the tough questions arise. So what exactly was the process by which Frances Fitzgerald came to nominate Maire Whelan for a post, apparently as said candidate sat at the same Cabinet table with her? When journalists and opposition parties began asking questions about Maire Whelan's appointment last week, they were told very little. They were assured that Whelan's nomination followed a long-standing tradition, which goes something along the lines of outgoing AGs get their pick of vacant judicial positions. The government can essentially nominate whoever it wants to the judiciary under the powers of the constitution. However, it has been 20 years since a government last appointed an outgoing Attorney General directly to a senior judicial position. That appointee was Harry Whelehan as President of the High Court in 1994, and that led to the collapse of the Fianna Fail/Labour government. The Judicial Appointments Advisory Board (JAAB) was introduced in the fall-out. Its panel of legal and lay members filter through applications for judicial positions from solicitors and barristers and forwards recommendations to government which makes the final decision. As with most controversies, the more questions are asked, the more questions arise. The JAAB is currently advertising vacancies across the court system, including the Court of Appeal. The seat on the Court of Appeal has been vacant since last March. When asked had anyone else applied for the job, the JAAB wouldn't say. However, the Department of Justice said it was told by JAAB that there were no suitable candidates for the vacancy at the Court of Appeal. However, as Fianna Fail's Jim O'Callaghan later pointed out, as the second highest court in the land, there is a practice of appointing only serving, experienced judges to it, because of the nature of the work involved. JAAB only deals with applications from barristers and solicitors, who are unlikely to be appointed to the Courts of Appeal. So that's why JAAB would not have had anyone to recommend. High Court judges looking for promotion fall outside of the JAAB net. Under an arrangement introduced by Alan Shatter, the practice is that they write directly to the Attorney General if they are interested in a post. The Irish Times reported that three High Court judges were interested in Court of Appeal job. They wrote to the Attorney General to express an interest in being appointed a judge of the Court of Appeal. So now you have the prospect of an Attorney General sitting at the Cabinet table while being nominated for a judicial post. And was the question that three High Court judges had written to her about the same job brought up? The thing is, if Maire Whelan did apply for the job through the JAAB, she may not get it. She is a barrister, not an experienced judge. She would also have to recuse herself from the proceedings because as AG she sits on the panel. The Government has refused to comment on this and also refuses to confirm reports that Maire Whelan remained at the Cabinet table while she was being nominated.